Cooking for guests is back in Jeyashri's kitchen. I have stopped the series after doing it for 20 weeks. I find it difficult for me to cook an elaborate meal on a normal day when i don't have guests. But i have been getting many mails from readers to resume it back again. Also they wanted to post how i plan to make the recipes . I will try to post it every week, but this time i may post with some pic collage too. Which means, i will just guide you with the meal planning , not that i will cook on a day the entire meal and click the picture and post. But will write in detail about the procedure and planning. Todays one comes with a snack menu. The theme for this snack is Madras street style food. I have read in a friend's post in facebook, that they had a madras street style food party at their home. When it comes to Street style food of madras, Idli, sambar, bajji, Thenga maanga pattani sundal, rose milk (famous kalathi kadai rosemilk of mylapore) big appalam, filter coffee.... so many things will come to my mind. 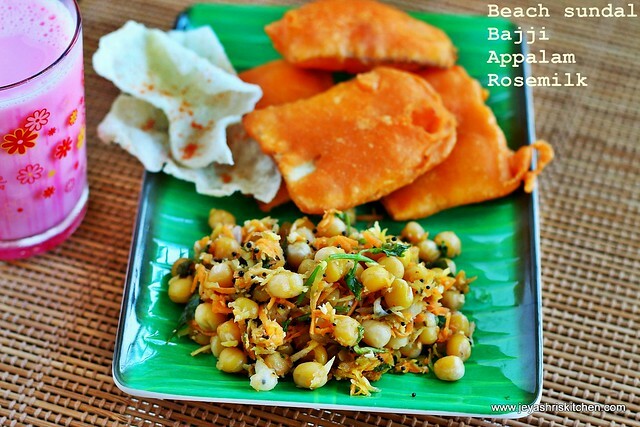 I just complied a simple snack menu with bajji, thenga maanga pattani sundal, appalam, and rose milk. If you want to make it elaborate you can add idli and sambar to the menu. Soak the peas overnight. If making idli, soak in the previous day evening by 5 pm and grind the batter for idli by 9 pm. Allow it to ferment overnight and keep it inside the refrigerator. Wash the soaked peas nicely and change the water. Since we are maing it for evening snack, you can cook it in the noon. If making sambar for idli, soak the moong dal for sambar for 15 minutes. By 2 pm, after you finish your lunch, pressure cook the dal for sambar and the pattani for sundal. when it is cooking, roast the ingredients for sambar and keep the tamarind extract ready. Also chop the veggies for the sambar too. Grate the carrot and mango for the sundal too. By now the pressure cooker must have done its job . Make the sambar now and keep it aside. Drian the water from the cooked pattani and keep it aside. When the sambar is done, just wash the same pan and start making the sundal. Keep the veggies for the bajji ready. 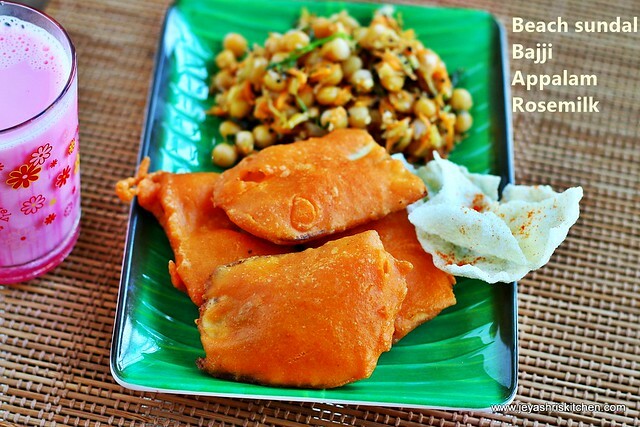 Also make the maavu|batter for bajji . If making rose milk, make it and keep in the refrigerator. If making filter coffee, make the decoction. Lets assume if your guests are coming by 4 30 pm. Slice the veggies for bajji and start making one batch of idli too. Keep oil for bajji and first fry the appalams. Before serving smear with red chili powder. I just break it into small for picture sake. If needed add some more oil and keep the flame either low or switch it off. Once the guests are arrived, start making bajjis. If needed on the side make one more batch of idli too. In the last make the filter coffee or serve the rose milk. If you want to make coconut chuntey you can make it in the morning and keep it in the refrigerator. If i missed out any details feel free to mail me at jeyashrikitchen@gmail.com. Share your tried recipes to the same mail id or message me in jeyashriskitchen facebook page. Each and everytime I read ur recipes and see the pics, I get a feeling like I should do like u atleast upto 50%. U r a great cook jeyashri. Hats off!!!!! I always use store bought one, never tried at home.